Asgiri Maha Vihara in Kandy completes 710 of service to Buddhism, culture, language and the Sri Lankan society on the Vesak full moon day. 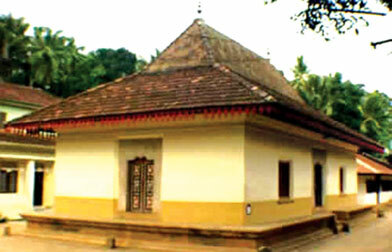 Asgiri Maha Vihara is also the Headquarters of the Shyamopali Maha Nikaya Asgiri chapter. Three other historical events connected to the Asgiri Maha Vihara is the arrival of the Sacred Tooth Relic to Senkadagala 419 years ago and the introduction of Upasampada or the higher ordination ritual for the bhikkhus from the then Rakkanga Desh 415 years ago on the Vesak full moon day. The Sinhala royal dynasty, one of the oldest dynasties of the world that lasted for over 2,000 years ended on May 13, 1739, 273 years ago on the Vesak day paving the way to the Waduga dynasty. The Sinhala royal dynasty, one of the oldest dynasties of the world that lasted for over 2,000 years ended on May 13, 1739, 273 years ago on the Vesak day paving the way to the Waduga dynasty. Sri Weeraprakrama Narendrasinghe's brother-in-law Vijaya who was in-charge of the royal Treasury in Hanguranketha at the time succeeded to the throne of Sinhale as Sri Vijaya Rajasinghe. President Mahinda Rajapaksa has taken steps to improve the infrastructure facilities of the Vihara complex and declare it as a sacred area as a tribute to the services rendered to the nation by the historic Maha Vihara and the Pirivena - the Institute of learning of the Bikkhus. The story of the Maha Vihara is the story of the Kandyan Kingdom and the people of Dumbara. Kundasala in Dumbara which was the capital of the kingdom was shifted to Senkadagala by Sri Vijaya Rajasinghe. These three events are inter-connected like three gems fixed to a gold necklace and cannot be separated from each other. Buwaneka Bahu I (1272-1284) the son of Vijaya Bahu III (1232-36) of Dumbara who inaugurated the Dambadeni dynasty succeeded the father and ruled from Dambadeniya. Later he shifted the kingdom to Yapahuwa and ruled for 12 years. He was succeeded by his son Buwanekabahu II (1293-1302) who chose Kurunegala to be his capital. He is also known as Vathhimi Buwanekabahu alias Yapahu Buwanekabahu. The Dumbara son is referred to as Manapathirenehe in the 'Dumbara Kadaimpotha'. Wendaruwa village now in the Teldeniya electorate was built by him. He encouraged the Buddhist clergy to start the Upasampada ritual in the month of Poson under State patronage. He promoted international trade in the country among countries around the Mediterranean sea. He was succeeded by his son Parakramabahu IV who was also known as Pandit Parakramabahu who wrote several books. 'The Dumbara Kadaimpotha' says that he was the son of Hammershan Khan a Malay army commander who came to help the king in his war against some invaders and adopted by the king in his own palace. The king ordered his Minister Siriwardhana Senadikari to go to katubuluwa and locate a place suitable to build a monastery. The minister with his entourage came to the area today known as Watapuluwa in the Municipal area of Kandy in search of a site for the purpose and cleared the area going hither and thither when he saw a person in mediation to the north of it. The following day he returned to the area and cleared the site and identified an area suitable for meditation, rest and bathing. Then he informed the king who was in Kurunegala that his mission was successful. It was a period of unrest and turmoil in the country due to internal rivalries, threats of foreign invasions and differences among bhikkhus themselves. Some of the Maha Theras living in Dimbulagala and Polonnaruwa moved to Dambadeniya and some to Achchagiri in Yapahuwa, yet another party fled to India. When the king heard about the situation he informed Ven. Palabathgala Dharmakeerthi, the pupil of Dimbulagala Mahathera Deepankara to send some bhikkhus to the new found site. The bhikkhus to the new monastery were selected by their own will with a unanimous decision. The team was headed by Dambadeniye Vanaratana Maha Thera and included Maha Theras. Meegaswewe Medhankara, Hiripitiye Kashyapa, Kongaswewa Dharmakeethi, Walaswewa Upatissa and novice bhikkhus Werawela Kolitha. The king ordered the entire route from Dambadeniya to Kurunegala and Kurunegala to Paranagantota ferry and from there to Senkadagala to be decorated in a manner befitting the occasion to conduct the dignified and venerable delegation among the vast crowds that would throng to witness the event. The delegation from Paranagantota ferry was conducted to Asgiriya. The ferry is still to be seen near the Ceylon Tobacco Company buildings and the present day terminal for the air-taxi flights that brings tourists to Kandy is also located here. The people of katubulu Danawwa the present Watapuluwa are served by three Raja Maha Viharas, Embela, Nittawela and Bomaluwa. The British troops headed by Major Davie in the Kandyan war of 1802 used the same ferry to cross when they marched to Senkadagala. The delegation to Asgiriya arrived on the full moon day in the month of Vesak 1307 completing 710 on the Vesak full moon day. The gloomy period to Asigiriya dawns with the reign of Rajasinghe I from Seethawaka. The king started to burn temples, disrobe the clergy, put them into prisons and annihilate the Kandyan aristocracy. The Asgiriya bhikkhus started to flee the area. The Asgiri Mahanayake Buwanekabahu Thera who was blind at the time fled to Kotakedeniya. The Anunayaka and some others fled to Hewaheta. Some others led by two brothers. Ven Suriyatissa and Ven. Irugaltissa fled to Galgepitiya in Uva. Some went to Medamahanuwara in Dumbara and some to Kotmale. Ellepola Mangala and Jayaweera Maha Theras accompanied by some other bhikkhus fled to Mulkirigala. Some of the ancient olas and manuscripts too were removed from Asgiriya. Rajasinghe murdered Weerasundara Bandara, father of the Konappu Bandara and placed Nikapitiye Bandara in the Kandyan Kingdom as Rajasuriya and went back to Seethawaka to restart his wars with the Portuguese. People of Dumbara assisted by Godakumbure Ranhoti Mudiyanse in Ambala Dunuwila killed Rajasuriya and placed Don Phillip alias Yamasinghe Bandara in the Senkadagala throne. After the incident Konappu Bandara, son of Weerasundara Bandara slained by Rajasinghe succedded to the throne in 1592 as Wimaladharmasuriya I. He is also from Deegalla in Dumbara Gampaha Korale. Devanagala Ratnalankara Maha Thera who was hiding in Uva came back to Asgiriya and crowned the king according to Buddhist customs. The king brought back the Sacred Tooth Relic hidden in Delgamu Vihara in Sitawaka in 1593 A.D. And deposited it in a palace built for the purpose and entrusted the performances of rites and rituals associated with the relic to Kotakedeniya Rajaguru Buwanekabahu Maha Thera. The services rendered to the Buddha Sasana, language education and culture, by the Asgiri Maha Vihara from that date upto now is enormous. It is a fitting tribute to the Maha Vihara and the people of the last Senkadagala kingdom are grateful for the gesture. Even today the monastery does yeoman service to improve the academic as well as religious education of the children in the area. The Sri Chandananda Vidyalaya under the guidance of the Mahnayaka Thera Most Venerable Udugama Sri Buddharakkitha under the able assistance of the founder principal Ven. Dr. Godagama Mangala Thera conducts educational program according to modern curriculum. The students are not only provided with an academic education but are also given opportunities in skills development. Students are exposed to modern computer knowledge, E-technology, communication and allied fields. The school has cadetting, western and eastern bands and a host of extra curricular activities for mental and physical development of the children. There are also a number of Sunday schools affiliated to the various temples of the complex. A bhikkhu education centre - a Pirivena similar to Totagamuwe Veedagama Gatara Keragala Galatunumula, in the Kotte era is established in the Maha Vihara premises. There are over one hundred resident Bhikkhus studying under the Parivenadipathi Ven. Narampanawe Ananda who has also established a similar pirivena in Teldeniya.